We take pride in providing the finest general practice veterinary care along with consistently heartfelt patient care and outstanding customer service. 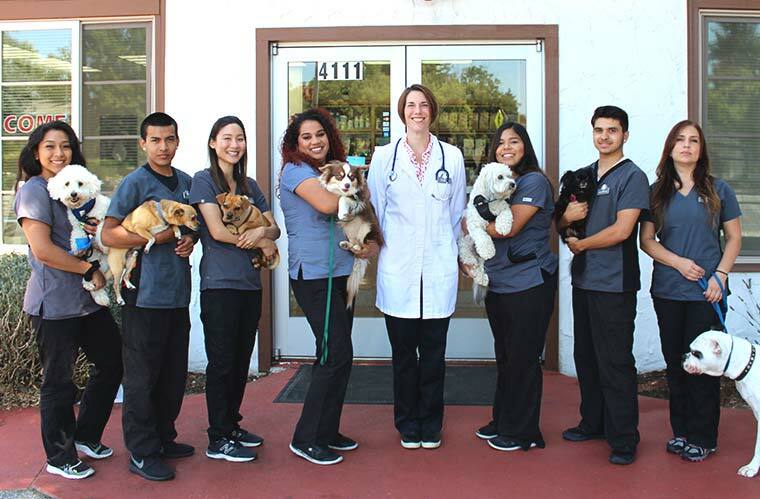 We believe in working as a team to care for your pets. We are dedicated to giving our all every day and doing so with joy, integrity, and compassion. It is our privilege to go the extra mile to make each of our clients and patients feel safe, secure, and well-cared for. Dr. Kristy Moding is a 2011 graduate of North Carolina State Veterinary School. Dr. Moding has a special interest in surgery, dentistry and laser therapy. She is dedicated to staying up-to-date on veterinary medical developments and spends much of her time outside of work reading veterinary research journals and articles. Dr. Moding is also passionate about volunteering to provide veterinary care free of charge to animals in developing countries and shelter pets in need. In her spare time, she enjoys horseback riding and travel. Dr. Moding also enjoys part-time practice in equine medicine. She currently lives in Redwood City with her husband, children and their maltipoo, Pancake. She feels so lucky to work with animals and the owners that love them! Tammy started working in the veterinary field over 20 years ago as a veterinary assistant. After several years of hard work and dedication ten years ago she was promoted to office manager. She has study dog behavior, training and all breeds of dogs. She has love and compassion for all animals. Outside of work, she dedicates her time to her three sons. Tammy’s family share their home with their three dogs an American Bulldog and two Chihuahuas. She enjoys hiking, watching movies and reading. Estella joined AHOPA in February 2016 and has been in the veterinary field for over 2 years. After 5 years of risk management she decided to follow her passion in nurturing animals. She is currently working towards her Veterinary Technician certification with an interest in anesthesia. Estella and her husband are humble servants of their two terrier mixes and a Jack Russell. In her free time she enjoys reading, spending time with her family and taking her dogs on adventures. Jamieleigh has always had a love and passion for animals from at a very young age. She started working directly with animals at an animal shelter where she worked as an animal care technician and volunteered as an animal behavior assistant for the past four years. She is a certified dog trainer and plans to start her own dog training business in the future; she is also studying to be a certified cat behaviorist as well. Now she has stepped into the medical field as a receptionist to further her knowledge in both the medical and animal behavior world. Joe has grown up in this field, Having his mom work at Animal Hospitals his whole life he has learned a lot.He started working with animals at a young age. He started here at AHOPA in 2016 working as a kennel attendant and now vet assistant. He has always had compassion and love for pets having quite a few of his own dogs, cats, a hamster, and 2 bearded dragons. He enjoys his job helping out the pets and making them feel comfortable during their time at the hospital and boarding. Andrew Volunteered one summer and was hooked. He loves working with the day care and boarding dogs and cats.He has been here over a year and a half and is in training to be a vet. assistant as well. Amber has been working for us since July 2018 she has compassion for all animals. She enjoys working to help clients and their furry family members. She loves taking her breaks outside to play with all the boarding and day care dogs. She will stat working towards becoming a vet assistant to add to her Job title.